"El Camino del Vino" Recap & The Wines of Walla Walla, Washington! Bonjour, my fabulous foodie friends! Following a whirlwind trip to a few of France's renowned wine regions I have been very remiss at keeping up with my posting. In my defense, sampling all that great wine and food was incredibly time consuming. Seriously, the trip was quite an adventure but before I jump into all the dish I wanted to report on the extraordinary South Florida Premier of El Camino del Vino at the Museum of Art Fort Lauderdale last month and also tell you about our event coming up this week. As you may already know from my previous post, the film was a fictionalized documentary featuring world renowned Sommelier Charlie Arturaola and his delightful wife Pandora Anwyl. 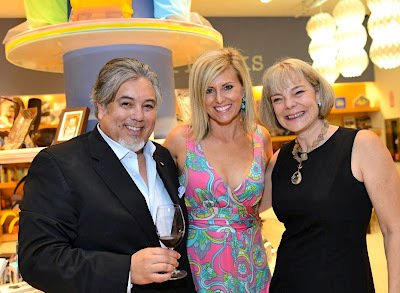 In addition to having many years of experience in the wine industry, these two special people also have deep roots in the South Florida community and have influenced many oenophiles during their respective careers. The premier at the Museum was very special because in attendance were many of their friends and colleagues who had not yet seen the film that had debuted at some of the most prestigious film festivals around the world yet had not made it to Florida. Needless to say, the film met with rave reviews from our guests, and Pandora and Charlie were kind enough to share many of the behind the scenes stories as well as their future plans (a second film perhaps?) during the Q&A following the screening. The festive crowd enjoyed an assortment of excellent Argentine wines provided by Republic National Distributing Company, our wine sponsor for the evening, and delicious cuisine from Miami's Gaucho Ranch, a purveyor of authentic grass-fed Argentine beef. All in all it was a wonderful evening and a true pleasure to work with Charlie and Pandora as well as Tom Davia at Shoreline Entertainment to bring this wonderful film to South Florida. For a look at some of the fun, please check out the slideshow! Our next installment of "The Art of Wine & Food" at the Museum of Art Fort Lauderdale will take place this Thursday, September 27th. I am happy to report we will be featuring a special guest, Howard Freedland of Bulletproof Wine and Spirits who will be presenting the wines of Seven Hills Winery from Walla Walla, Washington. The impressive wines from this pioneering Washington state winery are quickly catching the eye of critics and we are fortunate to be sampling some exclusive offerings during our tasting. For more information or to purchase your tickets to the event, please click here. Thanks again to all who supported last month's event and I hope to see you on Thursday!